When most people think of Abruzzo they think of mountains including the Appenines, the spine of Italy, but Italians know that Abruzzo stretches down to the Adriadic Sea, to fishing ports such as Giulianova or Pescara. There, fishermen ply their boats every day on the open water. According to the cookbook from the Abruzzo Society from which I have adapted the recipe below, the combination of shellfish and broccoli rabe is quite common in the region, partly due to barter between farmers and fishermen and in part because the farmers who have boats would take them out to supplement their incomes. The dishes that combine the fruits of the sea and good things from the earth are called mare e terra, sea and land, and seldom include meat. Abruzzo and the Adriadic are famous for their”little fishes” including pannochie(crawfish),.merluzzi (whiting), sardines, anchovies and small shrimp. Being a port ,Giulanova still has a lively fish market where shrimp, still dripping with seawater, are bought for dishes like these. “small ear” but penne or cavatelli will do as well, any shaped pasta for that matter. Bring a large amount of salted water to a boil. Separately heat oil and add the broccocoli rabe, cooking till crisp tender. Remove broccoli rabe to a side plate. Add the tomatoes and cook over open flame till they burst. Add the shrimp and the seasonings to taste. Cook 2 minutes. Cook the pasta according to directions. When al dente, remove 1 cup water and drain. Add ingredients to pasta, along with ricotta cheese and torn basil leaves. Stir to combine. Add additional water to get a consistency the family will like. Serve at once. 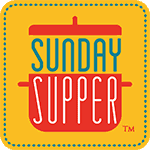 My Sunday Supper family is providing their favorite Italian dishes this week and here they are for your inspiration. Many thanks to Manuela from Manu's Menus who has been our host this week.